This set comprises three candles (one large and two small). 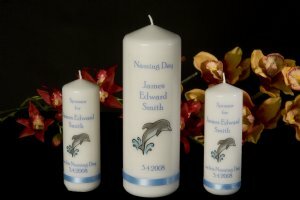 The main candle has the words Naming Day, then the dolphin image. Underneath is the child's name and date of ceremony. There is a band of blue ribbon at the base of the candle. The smaller candles are for the sponsor or godparent (please let us know your preference when ordering, as the default wording is sponsor). The sponsor candles have the words "sponsor for" then the name of the child, then the words "on his naming day" and then the date at the bottom. There is a band of light blue ribbon at the base of each candle. Each candle comes packaged in a beautiful organza bag.